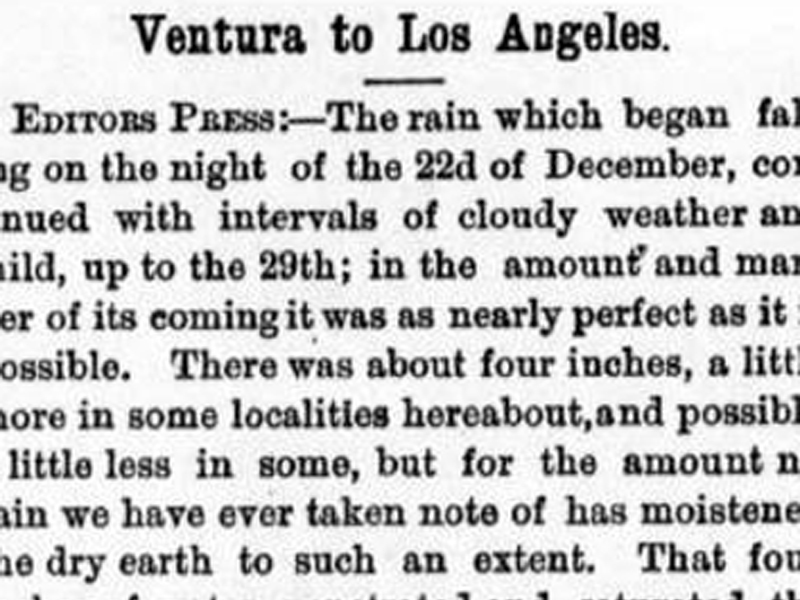 When a reporter for the Los Angeles Herald came north to check out the rumors of oil, he came through Beale's Cut; the Southern Pacific hadn't yet reached the SCV; and Alex Mentry wasn't yet here to bring in paying quantities of petroleum. Henry Newhall, who isn't mentioned in the story, bought most of the area under discussion two months earlier. 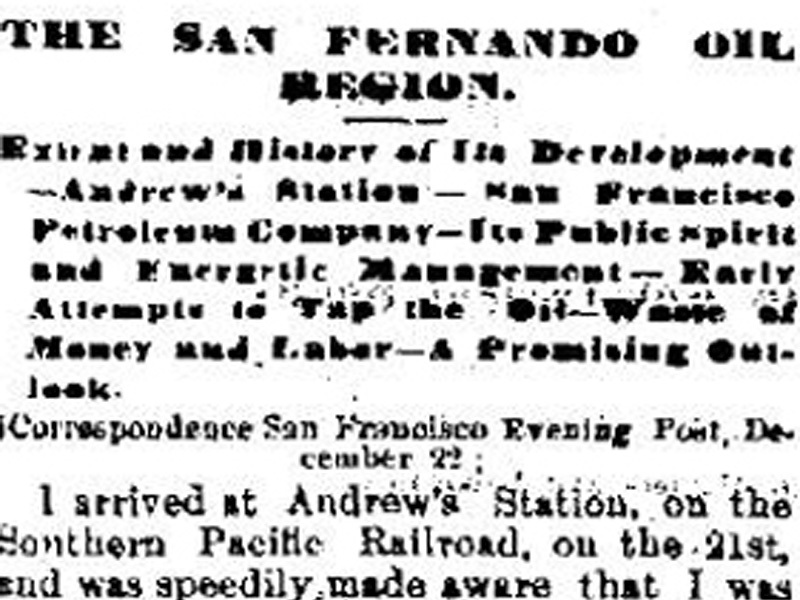 Items of particular interest: We see why the railroad tunnel lined up so accurately when it was completed a year later: It wasn't just worked end-to-end, but also from three points in between; and we see that a Kraszynski, apparently the brother of station agent Andrew Kraszynski, owned the local oil claims, in whole or part. Two Days in and around Lyon's Station — The Railroad Tunnel — A Herculean Project — The Oil Region — A Greasy Subject — but it May Prove a Rich One — Reliable Information About the Much Mystefied [sic] Section. Though unpretentious in itself, it is an inviting place for the weary denizen of the city, where he can play the recluse if he wish, breathe the invigorating mountain air and banish all thought of care and responsibility. The station proper is a well constructed frame building about 30x60 feet in dimensions and answering at once the purposes of a store, Postoffice, telegraph office, depot and tavern, being, altogether, the head centre of the adjacent valley. Besides this there is a large stable, and, back towards the foot-hills on the West, a little cottage half hid by a heavy growth of mountain oak. This makes up the sum total of Lyon's Station. Upon our arrival we found our old friend Captain Kraszynski in charge, who was doing the honors of mine host in the absence of his brother, the proprietor of the establishment. The Captain is one of those whole-souled men who never does things by halves in the matter of hospitality, and we have to thank him for the thousand kindly attentions which we experienced while under his roof-tree and which made our stay so pleasant. Which can scarcely be appreciated until one sees the immense walls of rock and contemplates the solid base which must be worked through by drill, blast and pick, meeting and conquering the fastness of Nature inch by inch. The length of this tunnel will be about 7,000 feet. Last Monday the Southern face was opened and the real undertaking in hand commenced. It is the intention of the engineers to prosecute the work simultaneously on both sides of the mountain and at three intermediate points. At equal distance from the extremities, inclined shafts will be sunk from above to the projected level of tunnel. In each of these shafts two forces will be employed, pushing their way in opposite directions. This will give eight faces, upon which as many parties will work, and, by the nicety of engineering skill, all will at last merge into the completed tunnel. Long and stubborn toil will be required to accomplish this, and if at the end of eighteen months a ray of light flashes through the mountain, the most sanguine expectations will meet a realization. Which may be seen in the vicinity would convince the most skeptical on this point. But a grave doubt has been suggested that, as the region shows unmistakable signs of volcanic upheaval, perhaps the oil basin has been shattered in like manner as the surface. The springs or pools found along the cañons may be, in this event, only the natural seepage through the rocks without indicating any considerable volume. Be this as it may, the question can only be settled by experiment, and a hundred wells might be bored without striking the oil basin, even did it exist. With its changeable tints of yellow, green and blue. In places where a sort of dam was formed by the boulders, were to be seen thick coatings of the real petroleum upon the surface, resembling pools of melted tar, the liquid being too thick to trickle through the obstructions and pass off with the stream. Upon emerging from this narrow defile, we saw a little to our right and in a small ravine in the mountain side the object of our search. When the sand through which the well was bored caved in, and put a quietus upon further proceedings. The operatives are now engaged in taking out this obstruction and sinking pipes to prevent similar accidents hereafter. The most sanguine hopes are entertained that oil will be eventually found in good paying quantities at this point, and the developments thus far made seem to give good grounds for the belief. A few rods down the cañon from the Temple well, is another flowing well or spring of petroleum, belonging to a Mr. Wiley, from which, we are assured, over a thousand barrels have been taken and shipped to San Francisco. As the market is unfavorable at present, no effort is made at further developments, or even to secure a natural flow. In another cañon three or four miles to the West, is the Pico oil spring, which is said to produce a superior quality of petroleum; but, without development, it is of small quantity. On the opposite side of the valley, and about three miles East of Lyons' Station, excellent oil indications are also found. They are in a deep cañon and situated similar to the others which we have mentioned. Is the original locator of these claims — eight in number — and still retains a controlling interest in them. At several places along this cañon we saw pools where the petroleum rose to the surface and flowed slowly away. One of these, high up on the mountain side, is dubbed, "The Chimney," and shows remarkably good indications. Another, called "The Danbury," shows a surface of petroleum about six feet in circumference and is continually bubbling with the gas which rises through it. We conclude that there is an oil-bearing stratum at least 15 miles in length running Northwest and Southeast and underlying all of the springs and oil claims which we have described. In this there may be an immense basin or chain of basins, which need only to be tapped by the drill to pour forth their endless wealth upon the fortunate possessors of the claims and make a second Venango county of the region. But this event lies as yet in the undeveloped future, and we can but patiently await the results of the investigation. 1. A walk or excursion; think "paseo." 3. The Temple claim was in Towsley Canyon. 4. Venango County is the historic oil region of Pennsylvania. Courtesy of Lauren Parker and Dr. Alan Pollack.